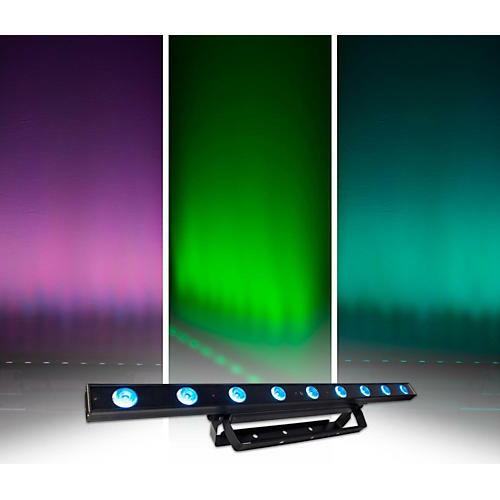 The CHAUVET DJ COLORband Hex 9 IRC is a full-size color LED strip light that functions as a chase effect, blinder or wall wash fixture. Its 6-in-1 technology (RGBAW+UV) allows you to generate a broad spectrum of colors and achieve natural-looking color temperatures. The COLORband Hex 9 IRC has 3 zones of control to create amazing chase effects. Convenient pre-built programs can be accessed with or without DMX but multiple DMX personalities are available for a wide variety of programming styles. The COLORband Hex 9 IRC has no moving parts and its silent operation is ideal for quiet environments. Automated programs and operation of static colors can be wirelessly controlled with the optional IRC-6remote and sound activated programs allow the COLORband Hex 9 IRC to dance to the beat of the music. Multiple units can be linked together with the CBB-6 and the fixture travels safely in the optional CHS-60VIP Gear Bag.